Increase the floor thickness for a much stronger platform to support your interior items. •Premium flooring gives you the strongest platform and is suitable for high intensity use. 19mm tongue and groove boards are used. The Montana has been upgraded with extra-high doors to make getting into the building easier. The eaves height (the lowest point of the roof) has also been raised, giving you a greater average ceiling height. Spacious and bright: With a generous height of 6'2", the Montana's door opening accommodates the majority of adults, so you won't be bumping your head every time you enter. The windowed door and accompanying side windows provide the log cabin with plenty of sunlight during the day. Faster and easier: The Montana has an overall building height of just below 2.5 metres, giving it a greater chance of avoiding issues with current planning regulations. Nevertheless, we still strongly advise contacting your local area's council for information on this, as different council boroughs can vary. The Montana lets you customise several important aspects of the construction, so you can get the exact building you want. 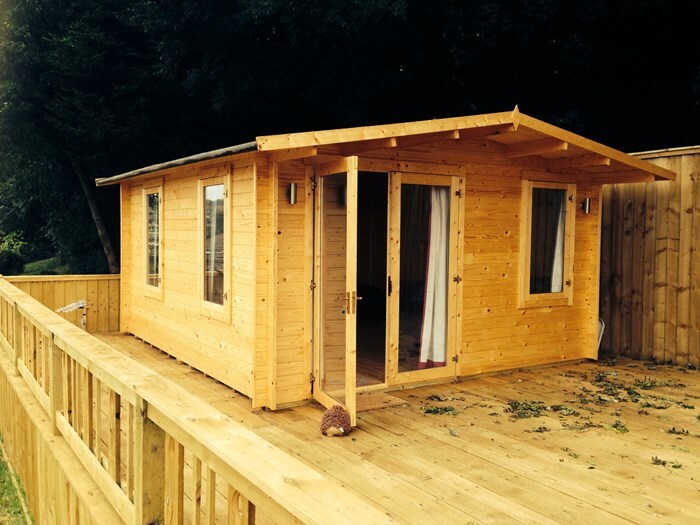 The log cabin can be assembled in several different configurations, letting you place the doors and windows in the optimal position for your garden layout. 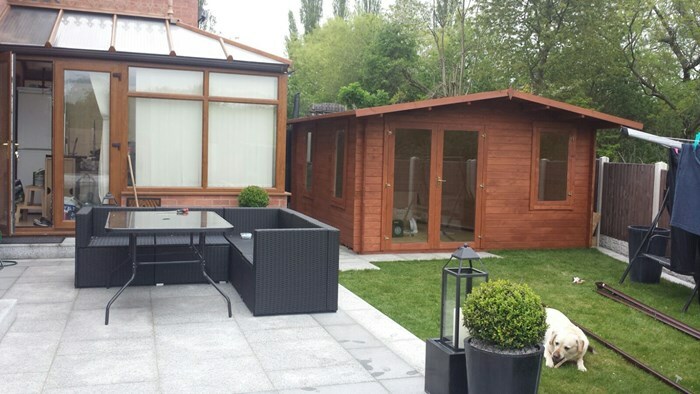 We also give you the choice of building size, floor timber thickness, door and window style, glazing style and roof covering to create the perfect garden building for your requirements. 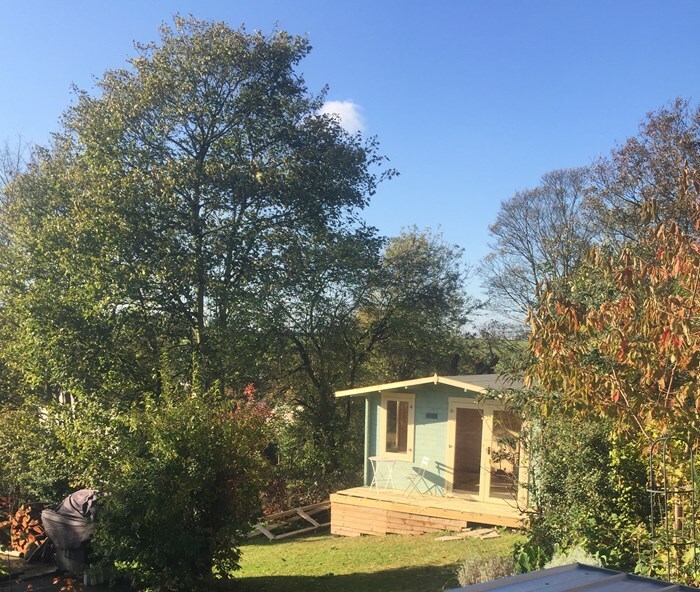 The Montana is constructed with interlocking timbers, a traditional building method that gives additional strength to all of the boards. Compared to the technique used for basic panel buildings, this is a far superior method that firmly fixes the timbers in place, using their combined weight to make the structure rock solid. 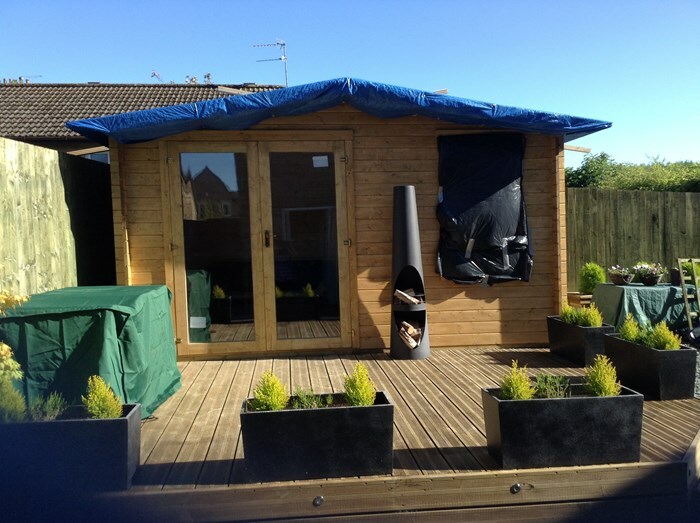 28mm tongue and groove timber is used for the walls of the building, a standard log cabin cladding that gives the Montana reasonable durability and insulation whilst still remaining affordable. 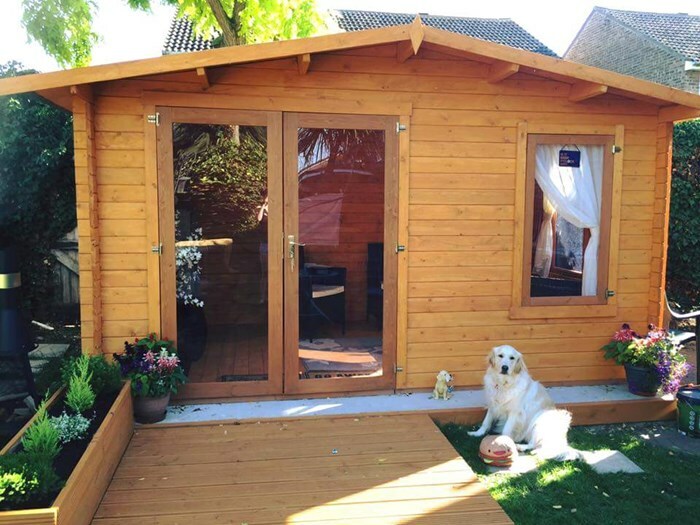 With walls that are much thicker than the typical garden shed, it has a sturdy construction to give you peace of mind and longevity. We give you the choice of two stunning building designs, letting you get the window styling that's right for you. Both styrene-glazed and double-glazing options are available in either style, so you can choose the level of insulation you need for your building. And with either style you'll also enjoy the unique feature of the Montana's front overhang, for an appearance that's full of character. Traditional Style (Georgian bars) – Premium and Standard options: The Traditional Style Montana Log Cabin features Georgian crosses upon the doors and windows, giving the building a classic British feel. Choose Standard for single styrene-glazed windows if you just have a seasonal summer house in mind, or Premium for an upgrade to double-glazing that will help keep you warm all through the year. Tongue and groove roof boards: The Montana's roof panels are constructed from quality tongue and groove timber, consistent with the rest of the log cabin. This helps increase the building's weather resistance and its overall longevity, making sure that it's built to last. Due to its position on the building, the roof is the part of the building that's most exposed and vulnerable to the weather, so it needs good protection. Choose one of our great roof weather protection options to make the Montana water-tight and keep it in great condition from day one. Premium weather protection: For the very best weathering capability available, fit your Montana log cabin with Premium heavy-duty shingles, available in a selection of green, red or black. 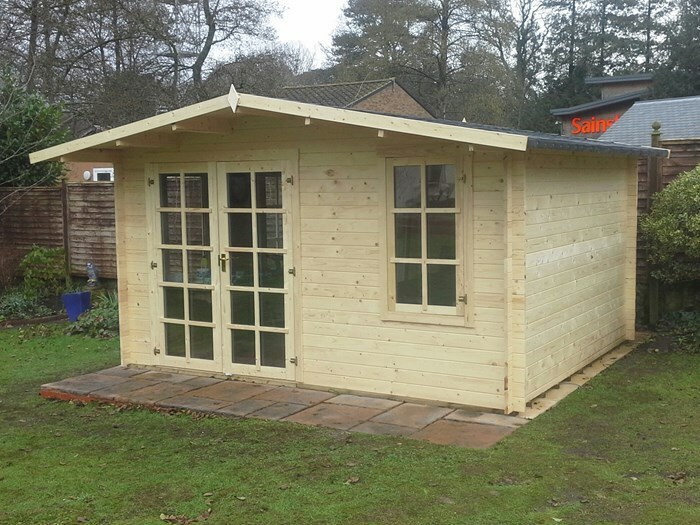 These are far thicker than our Standard weather protection option, providing the building with extra durability and value, as well as adding style. Our roofing shingles are UV resistant, water-proof, carry an SAA fire rating and are very long-lasting. Width 464.9cm 15'3" 464.9cm 15'3" 464.9cm 15'3"
Depth 292cm 9'7" 412cm 13'6" 505.2cm 16'7"
Width (Internal) 383.4cm 12'7" 383.4cm 12'7" 383.4cm 12'7"
Depth (Internal) 233.4cm 7'8" 323.4cm 10'7" 413.4cm 13'7"